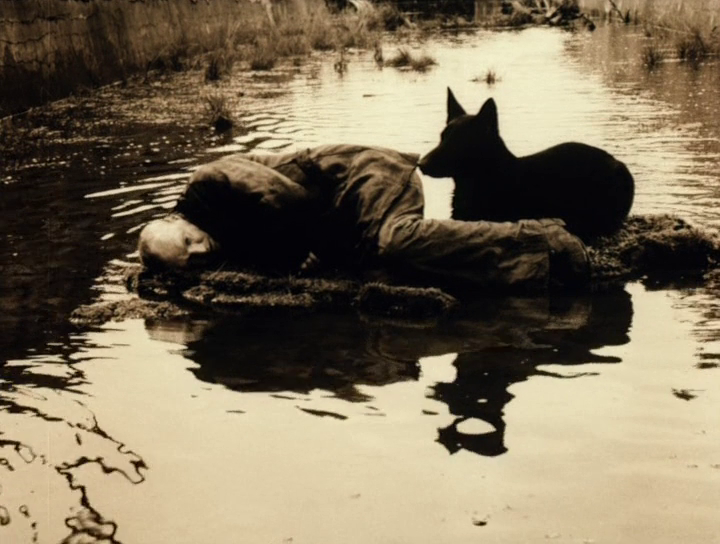 In Andrei Tarkovsky’s 1979 film Stalker three men undertake a perilous trip into the Zone, an off-limits and run-down post-industrial area full of the dangerous but valuable scattered debris left behind by a passing alien visitation (the leftovers of a “roadside picnic” as the title of the original novel by the Strugatsky brothers suggests). It is said that within the Zone there is a room with the power of making one’s innermost desires come true, even the unconscious ones – a ruthlessly rule-governed spot in a land of exception. The road to this room is full of mortal traps, often invisible to the eye. Your body could be crushed with artificial gravity or burned to cinders almost without a warning. Two of the men, who for different motives want to visit the room, hire the help of a third as a guide, a Stalker. The guide is overcautious as they advance, making the others walk in line and for short stretches at a time. He tests for the presence of traps by throwing metal nuts with long ribbons into the air looking for distortions in their trajectory. At one point they come very close to the building where the room is located and yet the Stalker convinces the other men that they should not enter it directly but they should instead take a very long-winded route leading away from it. The journey is arduous and confusing and the travellers often find themselves stuck confronting the same situations and dilemmas. The route parallels the inner personal journeys of the characters and their own stumbling blocks. I believe that such a situation is an accurate, if extreme, description of how motivations, rational judgements and emotional reactions interact during ongoing decision-making in real life. It certainly provides a better picture than the way these questions have been investigated in neuroscience, psychology and economics until recently. Our decisions are rarely isolated events, and their interaction is rarely additive. And yet these are the basic assumptions of most research on decision-making and on the interplay between the rational and emotional processes that underlie it. Judging a situation and making a decision is generally embedded within a dynamical context in which a path towards a longer-term goal is being laid down by our own actions. Consider a doctor prescribing a certain long treatment for a patient. The initial steps of the treatment may still serve a diagnostic function and as a result of one intervention, the doctor decides what the next step should be. Setbacks may as much indicate an insufficiency or an excess provoked by the treatment. And some interventions are deemed too risky to be used at first even though perhaps they would produce the desired effect and most quickly cure the patient. Past decisions, risk judgments and actions interact with not fully known time-extended processes in the world. Real life decision making is a non-linear journey into the unknown, where the unknown is constantly changing in part as a result of our own decisions. In a recent study, Manuel Bedia from the University of Zaragoza and I have examined this situation using a non-linear model of Antonio Damasio’s Somatic Markers Hypothesis. Our mathematical model considers the case of a journey towards a goal similar to the situation depicted in Stalker in a much more simplified setting. According to Damasio’s hypothesis, and to other so-called dual-process theories of decision making, the act of judging a situation and deciding on a course of action is not a simple cost-benefit analysis but a context-dependent mixture of rational and affective processes. The question we ask is: what counts as a good balance in this mixture? What factors determine how much we should rely on affective or rational processes? Our findings were surprising at first. The answer to our question turns out to be highly dependent on whether we consider decisions in a chain as independent events (the traditional linear approach) or allow for interactive coupling between decisions, moves, and situations in the world. We have found that the effect of primary emotions (often associated with conservative, cautious and protective actions) tend to be larger in non-linear decision chains than one would expect from their effect on single decision events. This results in over-cautiousness and leads to frequent re-visits to stumbling blocks until they are finally overcome. On average we tend to “stay on the spot” in a situation that again re-elicits the same emotional reactions that lead back to it in the first place. Secondary emotions (somatic associations between past experiences and visceral processes) are conceived as making sense only if their positive effect is larger than the combination of rational and primary emotional decision making. But again, this is true only for an isolated decision event. It turns out that badly attuned somatic markers – for instance, reckless and unreliable gut feelings that often would lead us to bad results (e.g., losing our cool, replying to an annoying email too angrily and too quickly) – can sometimes break the paralysing effect of over-represented cautionary emotions. In other word, in non-linear decision chains, a combination of “bad” decision-making mechanisms (over-cautiousness and recklessness) can lead to a positive chance of successfully attaining your goal. This is what we have shown mathematically. We might call this approach to decision making “enactive” in that decisions and actions affect the dynamics of the path that needs to be traveled towards a goal, a “path laid down in walking”. This famous phrase by poet Antonio Machado was picked by Francisco Varela and his followers to describe one of the central insights of enactive science: the fact that cognitive agents are participants and not merely observers. Apart from highlighting the importance of this perspective and showing that it makes a concrete, empirically testable difference, the result also has interesting developmental and evolutionary implications. It could help explain how somatic markers can exist in the first place if their positive effect depends on experiential tuning to the world and this tuning can only be poor at the early stages of development. If our result holds in such situations, it would indicate that in fact this is not a problem at all because even poorly attuned somatic markers can have a positive effect. Childish recklessness is after all one way of breaking out of the paralysis of excessive precaution and learning about the world and making your mark in it. How else are you going to make your way through the Zone and reach that room?